I’m fairly certain anyone who knows me or has read either of my blogs knows I love to read and always have. I believe it is important to read with children too. I taught public school for several years before being blessed with my own children, and I routinely read to my students, even as their math teacher. In fact, I spoke at state and national teacher conferences on how to teach math through children’s literature. I love books, and I want others to love them too. When I was pregnant with our first child, the art teacher at the school where I was teaching gave me a book. At the time, I thought it was odd to receive The Read-Aloud Handbook as a baby shower gift, since I had made it clear that I was planning to quit teaching once our son was born, and I would have an infant too small for read-alouds for several months. Little did I know how much this book would change my thoughts and actions. During the months after my son was born, I found that reading a book helped keep me awake during those nighttime feedings and helped pass the time during the day. I remember reading Francine Rivers’ Redeeming Love during the first few months, and the baby would fall asleep while nursing, so I would just sit and hold him until the next feeding and continue to read. (Oh, the joy and simplicity of the first baby!) At some point, I ran out of other things to read and decided to read The Read-Aloud Handbook. I was intrigued by all of the research Jim Trelease had done–the interviews, the surveys, the long-term studies, personal experiences, the proof that reading makes children smarter and more successful! I began reading aloud to my son right away, and it didn’t matter whether I was reading an educational book, a mystery, a romance, or a children’s book. He was hearing rich vocabulary, learning the rhythms and nuances of our language, being exposed to a variety of genres. Jim Trelease suggests using book baskets in the bathroom and at the kitchen table–places kids will spend some time–so I put some board books in a basket and set it on the kitchen table. I began reading to him at the table while feeding him his meals. He loved David Shannon’s Oh, David and wanted to hear it over and over and over again. I soon had it memorized. His first sister was born a couple years later, and I know I read to her before every nap and at bedtime, but I can’t recall if we had a book basket at the kitchen table. Her favorite book was Love You Forever by Robert Munsch, and I had that one memorized as well. When the twins came along more than four years after big sister, I must confess that I was out of practice for having an infant (let alone two! ), and it took me awhile before I began reading to the babies. Big brother was actually the one who began to read board books to his sisters when they were about two months old, and I quickly followed suit. We moved into our new house when the babies were four months old, and the house was in chaos for a few weeks because I spent most of my time caring for the babies. I kept putting off feeding them cereal, fruits, and vegetables. It was difficult to get them to eat without spitting it out, so I fed them individually for a couple months unless another adult was able to help me. Then they went through a phase (Who am I kidding? They are still in this phase!) where they would refuse to eat unless I entertained them in some way. This brought about a resurgence of our book basket. We have several board books in a small basket on the kitchen table, and I read them all to the babies at every feeding. I almost have them all memorized. They really enjoy The Greedy Python by Richard Buckley and Oh, David. We also have a tiny board book of “The Wheels on the Bus”, which I sing while trying to do the motions while holding the book with one hand and a spoon with the other hand. The effort is worth it when they finish their food without tears. 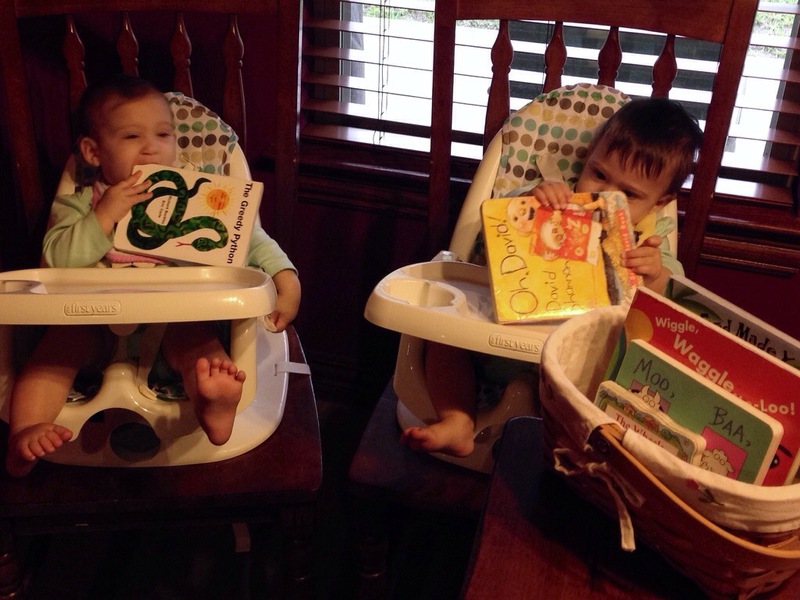 Both of our older two children continue to enjoy being read to, and they also enjoy reading on their own. Big brother is reading above grade level, and little sister is reading sight words and leveled readers in kindergarten. She also loves to read the board books from our book basket to the babies. She has them mostly memorized too. Reading is the ultimate weapon, destroying ignorance, poverty, and despair before they can destroy us. A nation that doesn’t read much doesn’t know much. A nation that doesn’t know much is more likely to make poor choices in the home, the marketplace, the jury box and the voting booth. And those decisions ultimately affect an entire nation – the literate and the illiterate. I would encourage every family and every teacher to have a copy of Jim Trelease’s The Read-Aloud Handbook or at least to begin reading aloud to your children, even to your teenagers. The book includes a “giant treasury of great read-aloud books” for all ages in case you are wondering where to start. You can purchase the Kindle version here or a paperback here on Amazon.